In 1561, an 86 year old Michelangelo Buonarotti was asked by Pope Pius IV to design a church in the city of Rome. At the time Michelangelo was already living in Rome, designing another church, St. Peters Basilica, for which he had just completed the wood model of the massive dome. He did not need this new commission for financial or status purposes, but Michelangelo had a restless spirit, which pushed him into achieving greater goals. He was attracted more by a new challenge than by the idea of actually finishing what he had begun. This commission was unequivocally something new for the artist to test the abilities he had perfected throughout his life and, in doing so, he created a final architectural masterpiece. The commission for Santa Maria degli Angeli was not meant to be a new construction project, but rather, it was an adaptation of the ruined ancient roman thermae; The Baths of Diocletian. In this reuse, Michelangelo's design of Santa Maria degli Angeli e dei Martiri within the ruins is a clear instance of a deliberate reuse of an existing structure by an architect; one that was not an assertion of power nor an accretion of material, but rather an architectural intervention that embraced change and provided a rebirth for a decaying structure. It has always been known that the church was built within the fabric of a ruin, but now, from a contemporary vantage point, what can be gained by re-framing it? Piecing together the history and architecture to create a basic understanding of why this project was successful; not as a new construction, but as an adaptive reuse. 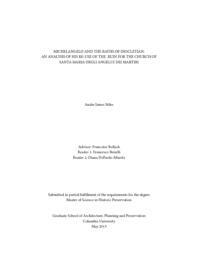 From the understanding of the site and 16th century preservation efforts, to an analysis of the circulation and materiality within the church, this thesis will examine Michelangelo's design to better understand his strategy.